An Interesting biography of Bono, U2 frontman and lead singer of the infamous rock band. U2’s Bono was born on May the 10th 1960 in the city of Dublin, Ireland. Bono’s real name is Paul David Hewson and growing up he attended mount temple comprehensive school in Dublin. The nickname Bono came from one of his high school mates who got the name from a local hearing aid store near where they grew up. The name bono stuck and ended up becoming his stage name for the U2 rock group. In our biography of bono from the band U2 we learn that in August 1982 he married his chilhood sweetheart Alison Stewart and the two of them now have four children together. 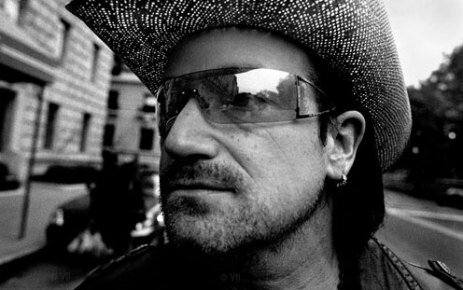 The U2 song “The Sweetest Thing” was written for Alison as an apology for Bono accidently forgetting her birthday while recording the best selling “The Joshua Tree” sessions. Not only is Bono an excellent singer and frontman for the band U2 but he is also a relentless activist and leverages his celebrity status to help in the fight against worldwide hunger, disease and poverty. He co-founded the non-profit organization DATA which helps raise awareness through the media and calls to action. It is very humbling to see such a famous rock star like Bono displaying such genuine humanity and great generosity to his fans, friends and family and it is this giving nature that has captured the hearts of many. U2 continue to write hit rock songs, tour the world and perform on stage for the fans and Bono is still singing and touching people with U2 songs such as “Sunday Bloody Sunday” and “Where The Streets Have No Name”. It has now been over 30 years since the band was formed which makes Bono and the band U2 legends when it comes to rock music and writing hit songs. One thing is for sure, that this will not be the last biography of Bono from U2 as he continues to progress from strength to strength.